The Youngstown State men's basketball team earned the No. 9 seed and will face No. 8 Cleveland State, Friday, March 3, at 8 p.m. in the first round of the 2017 Little Caesar's Horizon League Basketball Championships at Joe Louis Arena in Detroit, Mich. The winner will face No. 1 seed Oakland, Saturday, March 4, at 5:30 p.m. The Penguins (11-20, 5-13 Horizon League) and Vikings (9-21, 5-13 Horizon League) split the season series this year. Youngstown State defeated Cleveland State, 67-64, on Jan. 28 at the Beeghly Center. The Vikings won the most recent contest, 69-55, on Feb. 25, at the Wolstein Center. The Penguins own a Horizon League Tournament record of 4-15 since joining the league in 2001-02. Last season, the Penguins lost to Detroit, 92-79, in the first round of the tournament. The Penguins last win in the Horizon League Tournament was a 62-60 win over former league member Loyola in 2013. • This is the 88th meeting between Youngstown State and Cleveland State in a series that dates back to 1930. • The Vikings a slim 46-41 advantage in the all-time series and won the last meeting, 69-55, on Feb. 25, 2017. 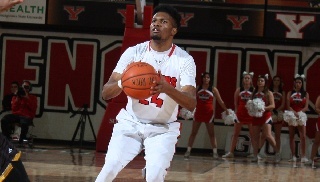 • YSU won the previous meeting, 67-64, on Jan. 28 at the Beeghly Center. • The Penguins are coming off a 69-55 loss at Cleveland State on Feb. 25 at the Wolstein Center. • Senior Jorden Kaufman posted the fifth double-double of his career with 16 points and 10 rebounds. • Junior Cameron Morse scored 15 points against the Vikings. • Head Coach Jerry Slocum has 721 career wins and became the 38th head coach in NCAA history to reach 700 wins. • Junior Cameron Morse now ranks tied for 16th all-time with 1,347 career points. • He is ninth nationally with 22.8 points per game, and led the Horizon League with 23.2 points per game in league games only. • His 637 points this year rank seventh on the single-season list.